Conclusion. Down North on the Labrador Circuit: The Court of Civil Jurisdiction 1826 to 1833. Many officials believed that the Labrador Court was an essential service for the residents of Labrador and for the fishermen and merchants who frequented there. It was also believed to have a deterrent effect on would-be offenders. Possibly it caused abuses by Americans and seasonal visitors to abate. The vessel hired to ferry the Court to Labrador was not a warship patrolling the coast but to outsiders it probably looked official. As Bannister rightly points out, the “Royal Navy conferred unrivalled material and symbolic power.” 116 In 1834 the Labrador Court was discontinued. The decision was a fiscal one associated with high costs required to support a legal system in Newfoundland and Labrador. Resounding in the minds of those in the House of Assembly were reports of the legal system's ineffectiveness. The Labrador Court cost a significant amount of money to run, traveled an inhospitable coast five hundred miles away for people they did not know and rarely if ever heard from. Coupled with the fact that Newfoundland's jurisdiction over Labrador remained tenuous, the fledgling legislature simply made a decision to cut costs where it ostensibly would be felt the least. The law figures prominently in Labrador's history. As England grappled with Labrador's position within the British Empire, Quebec and Newfoundland jock-eyed for lead in the legislative line. For a time Labrador was tied to Quebec. After 1809, Labrador's future lay with Newfoundland and subsequent events affected both legal histories. The Beard and Jennings case in 1820 was instrumental in removing the legislative role previously assumed by governors, thus exemplifying to British authorities the need for a local government. Newfoundland struggled with Labrador's place within its administrative structures. For years Newfoundland protected Labrador's coasts: fishing admirals, naval commanders, magistrates and judges brought various systems of justice to residents. At the first opportunity Newfoundland legislation took it away. Labrador lost the rule of law. As the politics of legal systems and jurisdiction over Labrador continued to percolate, Labrador's destiny would hang in the balance for many years. 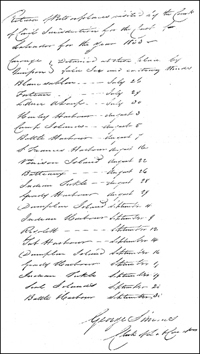 Execution order to Sheriff Robinson in 1830 to transport a prisoner. From Simms, George. Court of Sessions, Labrador, 1827-1832, Provincial Archives of Newfoundland and Labrador (PANL), GN5/G/1. with more information (344 kb).